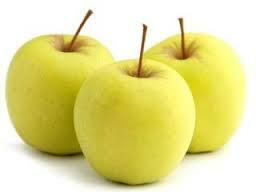 Golden Delicious has a bright yellow to golden skin colour, sometimes with a pink tinge. It is at its best when the skin turns from green to gold. It is excellent as an eating apple, with its crisp, creamy, white flesh, which is sweet, tasty and juicy. Golden Delicious originated in 1912 in West Virginia, USA.Being a naturally crisp fresh apple, we recommended using Golden Delicious apples in this healthy take on the classic apple crumble!